College Specific Books: Colleges have started asking students to buy college specific books. They take a commonly used textbook and have it printed with the college name and course number on the cover. This gives the book a new ISBN (International Standard Book Number) that is typically only available at the college it was made for. Ask the professor if it’s OK to use the book’s common version. “The common version will be available online and, in almost all cases, be much cheaper and apart from the cover, it’ll be the exact same. When you rent or buy it online, you’ll be able to rent or buy it used from anybody,” Manns says. eTextbooks: eTextbooks are usually more expensive than buying a book used or renting it, and they typically expire after six months or a year. Shop around. 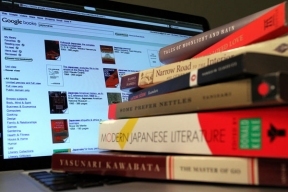 Most eTextbooks are available from multiple sellers. If you have the option, go old-school and buy the hard cover or paperback, which will typically be much cheaper. “That way you can keep it if you want, or you can sell it later,” he says. Timing: Sometimes students don’t learn what textbooks they need until a couple of weeks before classes start, giving them little time to shop around. Don’t worry too much about getting your books before classes start. If you don’t mind a little inconvenience, then wait until you’re a couple of days into the school year before buying. “The professor might even tell you that you don’t need the book,” Manns says. If it’s required, you can shop online and still have the book within a couple of days. Chris Manns is the managing director of the price-comparison websites CheapestTextbooks.com and TextbookRentals.com.